Warehouse Labor: What’s the Future of Work? What’s the future of work in America? Here is a tale of two workplaces. One was described in a recent article in The Atlantic that looked at Uber and the rise of the “gig economy.” That’s where technology platforms enable virtual workers to choose jobs with flexible schedules that better accommodate their lifestyles. The employer in the gig economy is a facilitator managing a digital freelancing platform. Overhead is low. Customers pay less. The star attraction is the business model; employees are commodities. A very different workplace was described in a recent issue of Advertising Age, featuring the best places to work in this progressive industry. The winners invested heavily in employee perks, training and development. In fact, the number one company, Metric Theory, will go so far as to help employees leave the company and find another job if that’s the path that best serves their career goals. In this work environment, the employer is a nurturer who understands that happy customers directly correlate with happy, talented and motivated associates. So what does all this have to do with warehouse labor and the logistics industry? 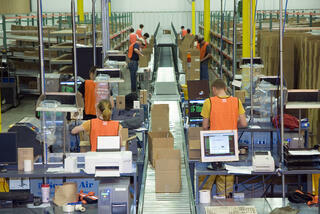 In warehouse management, labor is our biggest expense. We can’t afford NOT to think about the future of work and creating an environment to recruit, retain and grow an empowered workforce. In the 3PL space, with so much pressure from clients to reduce costs for warehouse labor, the temptation could be to dial back investments in staff development and, instead, maximize temporary staff – essentially treating employees like replaceable commodities. But what if we went in the opposite direction? What if, like the advertising agency described above, we amped up our investment in people? What if, instead of commoditizing certain staff positions, we made our drivers and warehouse associates the centerpiece of our value proposition – and invested in them with that in mind? You might argue that, in the advertising industry, high-level creative talent is hard to find, and even harder to keep, and that investing in this type of knowledge worker is required, whereas warehouse labor is more easily replaced. Okay, let’s talk Starbucks. Not the coffee, the wildly successful company. If you were at the CSCMP conference in San Diego in September, you may have heard Starbucks’ CEO Howard Schultz talk about the keys to the company’s success. His message was very single-minded: invest in your customer-facing associates because the company’s success hinges on their contributions. These cashiers and Baristas are not hard-to-replace knowledge workers. Yet Schultz sees fit to provide them with a solid benefits package, stock options, and free college tuition. Has the strategy paid off? Well, if you invested $100,000 in Starbucks stock in 1992, in 20 years that investment would have grown to $10,388,082 – a compound annual growth rate of 26.13%, crushing nearly everything that has come or gone since. Warehouse associates are the equivalent of Starbucks Baristas. They are the last people to touch the product before the customer. Success in warehouse operations comes down to people paying attention to details, making the right decisions, and thinking and acting like extensions of the customer’s business. People who stick around long enough to become part of a deliberate and honest culture of service. The future of warehouse labor management comes down to this: we can invest in the people who do the work, recognizing the critical value they deliver. Or, we can build a “cost-efficient” revolving door of detached, dispassionate associates who view work like Uber drivers in a “gig economy” and will move to the warehouse down the road for 5 cents more an hour. What’s the future of work at your company? If you outsource, has your 3PL built a culture to deliver the level of dependability and exceptional service that you and your customers deserve?